This week’s team challenge had the contestants cater a children’s party. 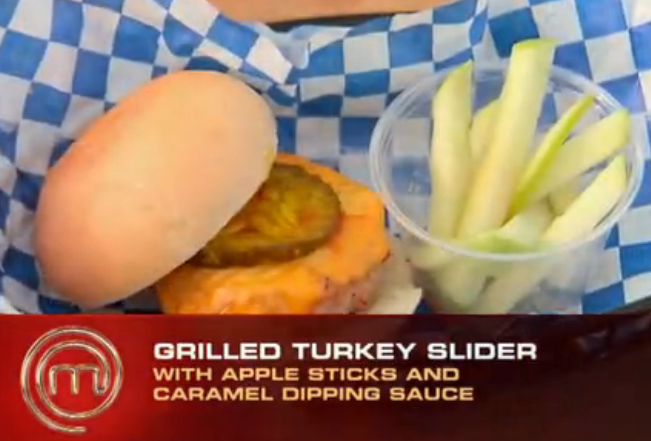 Each team had to develop a slider and a side dish, without using beef or potatoes, that the children would enjoy. 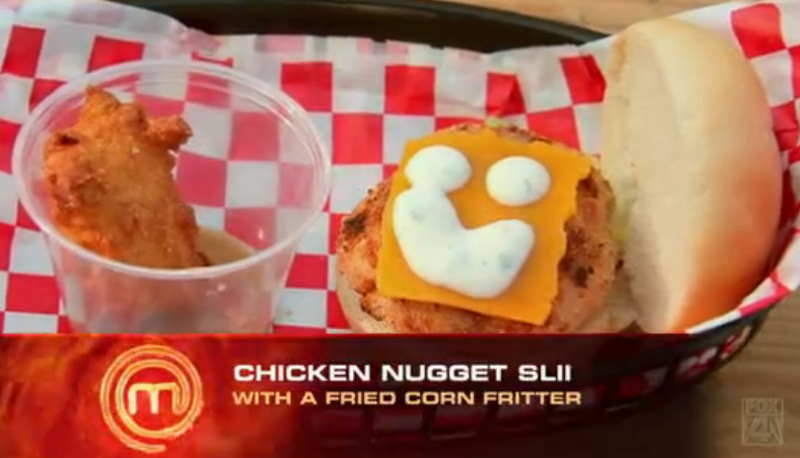 The Red Team made a chicken nugget slider with corn fritters while the Blue Team made a grilled turkey slider with apple sticks and caramel sauce. The Red Team was more collaborative and won the challenge as a result. With this challenge, I immediately knew that I wanted to make my own slider buns. My personal favorite sandwich bun of any kind is pretzel bread so it was really a no-brainer to attempt those and build the dish around them. With the bun decided, I thought that the best flavor profile would be to do a lamb burger with gouda, cucumber, pickled red onions and a kalamata olive aioli. With all of these different components, I had to use a lot of different recipes and enlist some grilling assistance from my brother to create this dish. The first thing I tackled was the pretzel bread slider buns. I used this recipe: Pretzel Slider Buns. The recipe was great and very clear with the step-by-step picture instructions. As a result, the pretzel bread turned out perfectly! The only problem was that the buns kept rising throughout the process and I ended up with regular-size buns instead of slider-size buns. So if you try this recipe, be sure to account for that and make the buns much smaller than what you think will work. Preheat oven to 400 degrees. Cut the head of garlic in half horizontally and place the two halves on a piece of aluminum foil. Drizzle 1 tablespoon of olive oil over the garlic and then fold up all four sides of the foil, pinching them together to make a pouch around the garlic. Roast the garlic until the cloves are tender and slightly browned, about 40 minutes. Let the garlic cool and then pop the cloves out of the skins. Smash the cloves into a paste and transfer them to a blender. Add 1 egg yolk, 1 tablespoon of lemon juice and 1 tablespoon of Dijon mustard and pulse several times to combine the ingredients. With the blender running, add 1/2 of a cup of blended vegetable oil (half olive oil, half vegetable oil) in a slow steady stream through the lid of the blender. Process until the aioli is think and smooth. Transfer to a small bowl and fold in 1/2 of a cup of chopped pitted kalamata olives. Set aside or refrigerate until ready to use. Finally, my brother grilled the lamb burgers. (I figure its a team challenge so its ok). He seasoned them with salt, pepper, and garlic powder. He grilled them for 4 minutes per side and melted the gouda cheese on them before taking them off and letting them rest for a few minutes. 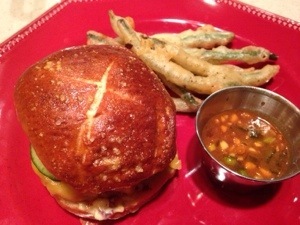 Then, I served them on the pretzel buns with both of the toppings and the condiment. To make the tempura batter: Whisk together 3/4 of a cup of all-purpose flour, 3/4 of a cup of cornstarch, 1 1/2 teaspoons of coarse salt, and 1/2 of a teaspoon of freshly ground pepper in a large bowl. Add 1 cup of cold soda water, whisking briskly until the batter is just slightly thinner than pancake batter. Heat 1 cup of canola oil to 375 degrees in a wide dutch oven or a large sauté pan with high sides. Using tongs or your fingers, dip the green beans in the tempura batter to coat, and fry them in batches, 10-12 beans at a time depending on the size of the pot. Slowly drop the beans in one at a time, being careful not to overcrowd the oil, which will drop the oil temperature, resulting in a soggy coating. When beans are golden brown, remove fried beans with tongs, transfer them to a paper bowl to drain, and sprinkle with salt and pepper. Repeat process in batches. I served the green beans with Alton Brown’s Soy-Ginger Dipping Sauce. While the dipping sauce was delicious, I was disappointed with my tempura green beans. The fried batter was much too heavy and they cooled down so fast that the texture was even more off-putting. I think I will have to try out a couple different batter recipes until I find one that I really like. On the positive side though, everything about the lamb burger was delightful. All of the flavors worked together magnificently and all I wanted to do was eat another one just like it after I was done. I had a lot of fun playing around with some different flavors with this challenge, but I’m not too sure how many kids would have liked it. At the end of the day though, I thoroughly enjoyed it and that’s what really matters.